Abstract: The past year has seen the periodic arrest by the Islamic State of a number of its scholarly figures, including Abu Ya‘qub al-Maqdisi, a man described by some as the group’s “mufti.” The crackdown on these scholars has to do with an ideological rift in the Islamic State over the doctrine of takfir. Last year, an audio series called the “Silsila ‘ilmiyya” was released with the aim of putting this dispute to rest, but the infighting has persisted and, in fact, escalated, undermining the ideological integrity of a group that claims to speak with one voice. The purpose of the “Silsila ‘ilmiyya,” as the first episode explained, was “to unify the [Islamic] State and unite the hearts of its soldiers around the truth.” Thus far, however, it has done nothing of the sort. Far from bringing harmony, it has rather stoked further discord in the ranks of the Islamic State and its online support network. Meanwhile, al-Bin‘ali’s successor as head of the Office of Research and Studies, described by his supporters as the Islamic State’s “mufti,” is currently being detained. The charges against him may well lead to his execution, doing further damage to the group’s ideological coherence. While the Islamic State remains stronger today than is commonly thought, the internal schism over ideology is doing lasting damage in a way that has yet to be appreciated. In the eyes of the Islamic State, the “polytheists” in question are the professed Muslims living in Iraq, Syria, and other Islamic countries who have allegedly committed some act of “polytheism” (shirk). This can mean voting in a democratic system or supporting rulers who fail to rule by Islamic law, among other things. When it comes to the polytheistic nature of such practices, the Islamic State is largely agreed. Where it has had difficulty formulating a consensus is in determining which people exactly are to be deemed polytheists, and so subject to takfir, and which people, if any, may be excused their theological shortcomings on account of either ignorance (jahl) or possession of an alternative religious interpretation (ta’wil). Several years earlier, he spelled out his thinking on the subject at greater length in a lecture delivered in Raqqa.6 “Many of the nullifiers of Islam,” he declared, “are subject to rules and restrictions,” upon which he proceeded to elaborate. One of the upshots of these rules and restrictions, he said, is that most of the world’s professed Muslims are to be presumed Muslim unless proven otherwise. In particular, the inhabitants of the so-called “lapsed abode of unbelief” (dar al-kufr al-tari’)—that is, the abode of Islam (dar al-Islam) that has reverted to being the abode of unbelief (dar al-kufr) on account of the fact that Islamic law is no longer applied there—are to be given the benefit of the doubt as concerns their Islamic faith: the presumption is that they are Muslims, not unbelievers. This was a controversial position in the Islamic State, as evidenced by the outbursts of dissenting audience members at al-Bin‘ali’s lecture.b But it was representative of the more nuanced approach to takfir promoted by the Office of Research and Studies. Those with the least nuanced approach, and hence the most prone to takfir, have been concentrated in the Central Media Department (Diwan al-I‘lam al-Markazi). The Islamic State’s Delegated Committee, its executive body, has tended to occupy something of a medial position, leaning in one direction or the other at different points in time. The May 2017 memo on takfir counted as a victory for the more takfir-prone faction identified with the Media Department, while the “Silsila ‘ilmiyya” was seen as a triumph for the more takfir-averse identified with the Office of Research and Studies. The pendulum, however, appears to be swinging back in the other direction. The six episodes of the “Silsila ‘ilmiyya” can be summarized as follows. The first is an introduction explaining the purpose of the series, railing against “the theoreticians of extremism in takfir” and examining the causes of the current division in the Islamic State. The second treats the meaning of the term “foundation of the religion” (asl al-din), defined as consisting of four elements: “the affirmation of God, the worship of Him alone, the eschewal of the worship of all others besides Him, and dissociation from those who assign partners to God.” These are held up as necessary conditions of faith, meaning that they must be acknowledged and practiced for one to be considered a Muslim. Ignorance, it is stated, is no excuse for failing to observe these articles of faith. In other words, the principle of “excusing on the basis of ignorance” (al-‘udhr bi’l-jahl) is not operative as concerns the foundation of the religion. The third episode is the heart of the series. Here it is argued that takfir does not form a part of the foundation of the religion, but rather is “one of the requirements of the religion” (min wajibat al-din). This is to say that while takfir of polytheists is a religious duty, it is not a foundational one. Failure to engage in takfir does not jeopardize one’s status as a Muslim. The fourth episode, building on the third, introduces the notion of “levels” (maratib) in takfir, the idea being that takfir is not always a clear-cut judgment. On its face, then, the “Silsila ‘ilmiyya” was in nearly every respect a victory for the Islamic State’s scholars against the “extremists” behind the May 2017 memo and their allies in the Media Department. Most important, they succeeded in downgrading takfir from “one of the manifest principles of the religion” to “one of the requirements of the religion,” thereby creating room for reasonable disagreement as to who is a “polytheist” and who is not. In early July 2018, an online media group called the al-Turath al-‘Ilmi Foundation (Mu’assasat al-Turath al-‘Ilmi) published the transcripts and audio files of three episodes of the “Silsila ‘ilmiyya” that had never aired.13 In an accompanying statement, al-Turath explained that the original series consisted of nine episodes, all of which had been approved by Abu Bakr al-Baghdadi.14 At the last minute, however, as the statement relates, a man named al-Hajj ‘Abdallah, who appears to be a high-ranking member of the Delegated Committee—one source describes him as the caliph’s “deputy” (na’ib)15—intervened to delay the release of three of them, on the grounds that they might upset certain “extremists” in the group. The three missing episodes were, according to the statement, supposed to be the fourth, sixth, and seventh in the series. Of the original nine, they are the most discouraging of takfir. The fourth is a rebuttal of some of the “extremists’” arguments in favor of including takfir within the scope of the foundation of the religion. The sixth dives deeper into “the third nullifier,” explaining that it has a perilous flip side—namely, that one who wrongfully excommunicates a Muslim exposes oneself to takfir. And the seventh presents further evidence against wrongfully excommunicating Muslims. It would appear, then, that these episodes were indeed withheld as part of an effort not to alienate the more takfir-prone among the caliphate’s backers. The statement by al-Turath goes on to say that the missing episodes were originally slated to be al-Turath’s first release upon its launch in October 2017, when it began leaking the unpublished works of the Office of Research and Studies. But it decided to give the Media Department more time. Finally, al-Turath determined that the Media Department had been recaptured by the “extremists” and purged of their opponents, at the direction of the aforementioned al-Hajj ‘Abdallah. 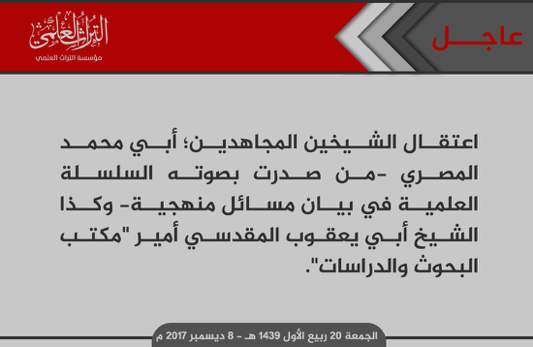 Similarly, back in December 2017, al-Turath reported that the “extremists” had been restored to their positions in the Islamic State’s Delegated Committee, after having been sacked by al-Baghdadi in the months before.16 Indeed, the impression given by al-Turath’s various news reports is that the “extremists” are very much back in control. From the perspective of the Media Department, the Office of Research and Studies, in cooperation with al-Turath, has gone rogue. Since October 2017, al-Turath has released dozens of books and essays by the scholars of the Office of Research and Studies, including a six-volume compendium prepared by al-Bin‘ali, in addition to numerous audio files of lectures and speeches. The Media Department has been highly critical of these unauthorized releases. In an official statement in July 2018, it instructed supporters of the caliphate not to publish or circulate such unauthorized materials—whether written, audio, or visual—claiming that “they do not represent the Islamic State, its provinces, or its leadership.”17 In his August 22, 2018, speech, al-Baghdadi said something similar, warning his supporters not to believe news reports that do not issue from the Central Media Department.18 The fact that he only referred to news reports (akhbar) is likely an indication that he does not wish to alienate the scholars of his group, however upset he may be with them. The charge sheet against Abu Ya‘qub includes the following transgressions: publishing his writings online without the consent of al-Baghdadi; defying orders to report to the frontlines; spying on the Islamic State on behalf of Abu Muhammad al-Maqdisi, the influential jihadi ideologue in Jordan who has been a major opponent of the group; dividing the ranks of the Islamic State by claiming that its rulers have acted unjustly; concealing the whereabouts of Abu Muhammad al-Hashimi, a dissident scholar who wrote a searing critique of the Islamic State in the wake of the May 2017 memo;22 rallying the group’s scholars to put pressure on the leadership to submit to their demands; collaborating with another Islamic State dissident, Abu Suhayb al-Najdi; refusing to hand over the “red stamp” bearing the logo of the Office of Research and Studies; and issuing fatwas that run contrary to the correct Sunni methodology (manhaj) on unspecified issues. On September 12, 2018, the al-Wafa’ Media Foundation, an ally of the al-Turath al-‘Ilmi Foundation, appealed for divine intervention in the case of Abu Yaq‘ub. 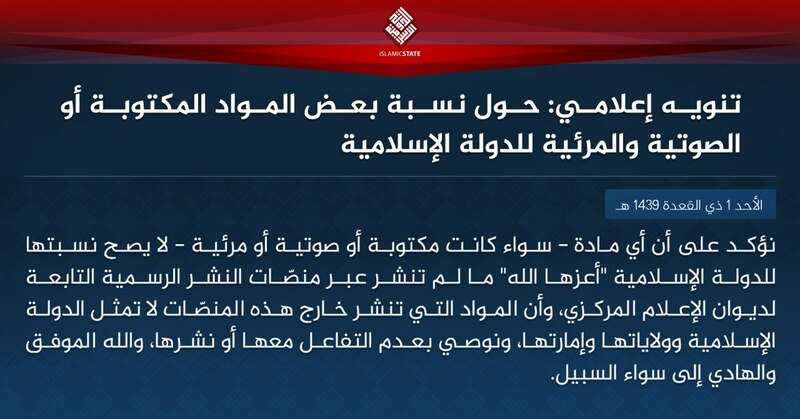 “We ask God to save the mufti of the Islamic State,” it wrote on its Telegram channel.25 Whether this prayer is answered or not, it is abundantly clear that the Islamic State’s ideological integrity, much like its territorial integrity, has been severely compromised. Al-Baghdadi has sought to hold both sides of the ideological dispute in check by striking a balance. But the balance has long been precarious, and is proving increasingly untenable. Over the past year, the scholars of the Office of Research and Studies have found themselves on the losing side of this balancing act. With the “Silsila ‘ilmiyya,” it seemed as if the balance had been restored in their favor, but they are evidently convinced that the “extremists” remain firmly in control. Meanwhile, those who hold the levers of power in the Islamic State have grown weary of the scholars’ frequent protests and leaks. [a] The advocates of the more hardline approach to takfir in the Islamic State have been referred to by their enemies as “extremists” (ghulat) and “Hazimis” (Hazimiyya), the latter in reference to a Saudi cleric named Ahmad ibn ‘Umar al-Hazimi. Al-Hazimi introduced a controversial doctrine known as takfir al-‘adhir, meaning “excommunication of the excuser.” Derived from a strict reading of “the third nullifier,” it stipulates that anyone who “excuses” the unbelief of an unbeliever has committed unbelief oneself and is therefore subject to takfir. Because there are disagreements among jihadis over who is and is not an unbeliever, the doctrine is highly contentious. 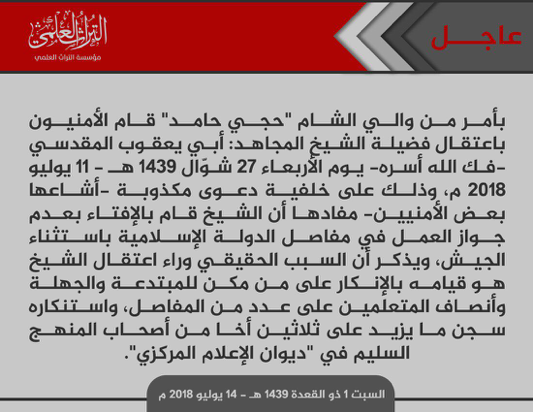 A group of “Hazimis,” led by the Tunisian Abu Ja‘far al-Hattab, was executed in 2014, but according to al-Bin‘ali, their hardline approach resurfaced under a new guise—the demand that takfir be considered “a part of the foundation of the religion” (min asl al-din). See al-Bin‘ali’s letter to the Delegated Committee, dated February 13, 2016, available at http://www.jihadica.com/wp-content/uploads/2018/09/Binali-to-DC.pdf. [b] Their interjections can be heard throughout the lecture. [c] According to one source, Abu Ya‘qub’s real name is Ahmad ibn Yusuf Simrin. See Abu Salim al-Muhajir, Iqaf al-dalil wa-bayan fasad al-ta’sil li-man jadala ‘an al-mutawaqqif fi takfir al-mushrikin, March/April 2018, p. 3, available at http://www.jihadica.com/wp-content/uploads/2018/10/iqaf-al-dalil.pdf. The circumstances of al-Bin‘ali’s death have been discussed by several of his colleagues. See, for instance, Abu Muhammad al-Hashimi, al-Nasiha al-Hashimiyya li-amir al-Dawla al-Islamiyya, July 5, 2017, available at http://www.jihadica.com/wp-content/uploads/2017/09/al-Nasiha-al-Hashimiyya.pdf. For background on the theological crisis sparked off by the takfir memo, see Cole Bunzel, “Caliphate in Disarray: Ideological Turmoil in the Islamic State,” Jihadica, October 3, 2017; Cole Bunzel, “A House Divided: Origins and Persistence of the Islamic State’s Ideological Divide,” Jihadica, June 5, 2018. For the memo itself (“Li-yahlika man halaka ‘an bayyinatin wa-yahya man hayya ‘an bayyina,” May 17, 2017), see http://www.jihadica.com/wp-content/uploads/2017/09/tamim_h_8_t_31.pdf. For an English translation, see “That Those Who Perish Would Perish upon Proof and Those Who Live Would Live upon Proof,” Jihadica, May 17, 2017, http://www.jihadica.com/wp-content/uploads/2018/09/That-Those-Who-Perish.pdf. For the transcript of the audio series, see http://www.jihadica.com/wp-content/uploads/2018/09/silsila-ilmiyya.pdf. For an English translation, see “Knowledge Series Clarifying Matters of Methodology,” Ahlut-Tawhid Publications, Jihadica, http://www.jihadica.com/wp-content/uploads/2018/09/Knowledge-Series.pdf. See al-Durar al-saniyya fi ’l-ajwiba al-Najdiyya, ‘Abd al-Rahman ibn Qasim ed., 16 volumes (Riyadh: Warathat al-Shaykh ‘Abd al-Rahman ibn Qasim, 2012), 10:91-93, at 91. For the letter, see http://www.jihadica.com/wp-content/uploads/2018/09/Binali-to-DC.pdf. For the letter, dated May 19, 2017, see http://www.jihadica.com/wp-content/uploads/2017/09/Binali-letter.pdf. Turki al-Bin‘ali, “al-Tahakum lil-mahakim al-wad‘iyya; for the transcript, see http://www.jihadica.com/wp-content/uploads/2018/09/al-tahakum.pdf. Abu Suraqa al-Hashimi, “Qul hal yastawi ’lladhina ya‘lamuna wa’lladhina la ya‘lamun,” Mu’assasat al-Wafa’ al-I‘lamiyya, December 22, 2017, available at http://www.jihadica.com/wp-content/uploads/2018/09/qul-hal-yastawi.pdf. [Abu Ya‘qub al-Maqdisi,] al-Ba‘ith ‘ala itmam al-naqid al-thalith, September/October 2017, http://www.jihadica.com/wp-content/uploads/2018/09/al-baith-ala-itmam-al-naqid-al-thalith.pdf. Abu Ya‘qub al-Maqdisi, Nasiha hawl mawdu‘ al-bayan, Mu’assasat al-Turath al-‘Ilmi, available at http://www.jihadica.com/wp-content/uploads/2018/09/nasiha-hawl-mawdu-al-bayan.pdf. See, for instance, the statement by “Wa-harrid al-mu’minin,” Telegram Messenger, September 12, 2018, available at http://www.jihadica.com/wp-content/uploads/2018/09/wa-harrid-telegram.jpg. News report from Mu’assasat al-Turath al-‘Ilmi, December 8, 2017, available at http://www.jihadica.com/wp-content/uploads/2018/09/turathnews1.png. See the various news reports by Mu’assasat al-Turath al-‘Ilmi from December 2017 to September 2018, available at http://www.jihadica.com/wp-content/uploads/2018/09/turath-reports.pdf. In late August 2018, the Islamic State issued a new version of the “Silsila ‘ilmiyya,” with no substantive changes but read by another speaker. This was likely an indication that al-Masri no longer enjoys good standing with the group’s senior leadership. See further at Cole Bunzel, “New turn in the saga of ISIS’s silsila ‘ilmiyya (its audio series intended to clarify disputed matters of ideology). Yesterday the group reissued the series with a different voice, as previous reader (Abu Muhammad al-Masri) is no longer in good standing (1/3),” Twitter, August 29, 2018, available at pic.twitter.com/1O4PrgzhNF. For the transcript of the three missing episodes, see http://www.jihadica.com/wp-content/uploads/2018/09/tatimmat-halaqat.pdf. “Bayan wa-tawdih bi-khusus tatimmat halaqat Silsila ‘ilmiyya fi bayan masa’il manhajiyya,” Mu’assasat al-Turath al-‘Ilmi, July 7, 2018, available at http://www.jihadica.com/wp-content/uploads/2018/09/bayan-wa-tawdih.pdf. “Hadha ma katabahu Zakariyya al-Qardashi ila ’l-shaykh al-Hajj ‘Abdallah,” available at http://www.jihadica.com/wp-content/uploads/2018/09/Zakariyya-al-Qardashi.pdf. News report from Mu’assasat al-Turath al-‘Ilmi, December 8, 2017, available at http://www.jihadica.com/wp-content/uploads/2018/09/turathnews2.png. “Tanwih i‘lami hawl nisbat ba‘d al-mawadd al-maktuba aw al-sawtiyya aw al-mar’iyya lil-Dawla al-Islamiyya,” July 15, 2018, available at http://www.jihadica.com/wp-content/uploads/2018/09/tanwih-ilami.jpg. Abu Bakr al-Baghdadi, “Wa-bashshir al-sabirin,” Mu’assasat al-Furqan, August 22, 2018. News report from Mu’assasat al-Turath al-‘Ilmi, August 30, 2018, available at http://www.jihadica.com/wp-content/uploads/2018/09/turathnews3.png. News report from Mu’assasat al-Turath al-‘Ilmi, July 14, 2018, http://www.jihadica.com/wp-content/uploads/2018/09/turathnews4.png. Excerpts of the August 30 statement can be found in Ghandar al-Muhajir, “Jala’ al-basa’ir fi ’l-radd ‘ala ’ftira’at ‘Abd al-Qadir,” al-Nasiha, September 7, 2018, available at http://www.jihadica.com/wp-content/uploads/2018/09/jala-al-basair.pdf. See Abu Muhammad al-Hashimi, al-Nasiha al-Hashimiyya li-amir al-Dawla al-Islamiyya, July 5, 2017, available at http://www.jihadica.com/wp-content/uploads/2017/09/al-Nasiha-al-Hashimiyya.pdf. “Bayan min talabat al-‘ilm fi ’l-Dawla dhabban ‘an ‘ird al-shaykh al-mujahid Abi Ya‘qub,” available at http://www.jihadica.com/wp-content/uploads/2018/09/bayan-min-talabat-al-ilm.pdf. 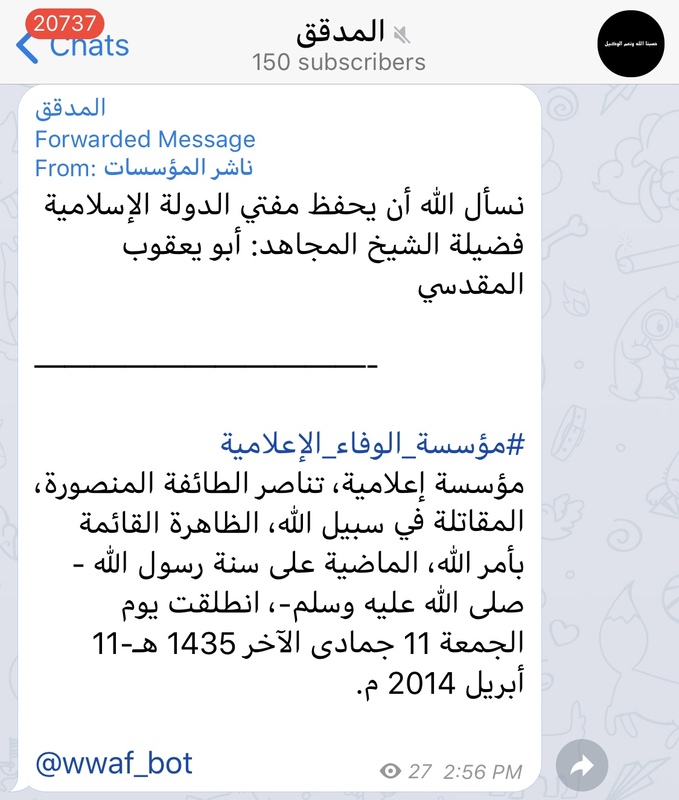 Statement by Mu’assasat al-Wafa,’ Telegram Messenger, September 12, 2018, available at http://www.jihadica.com/wp-content/uploads/2018/09/al-wafa-Abu-Yaqub.jpg. 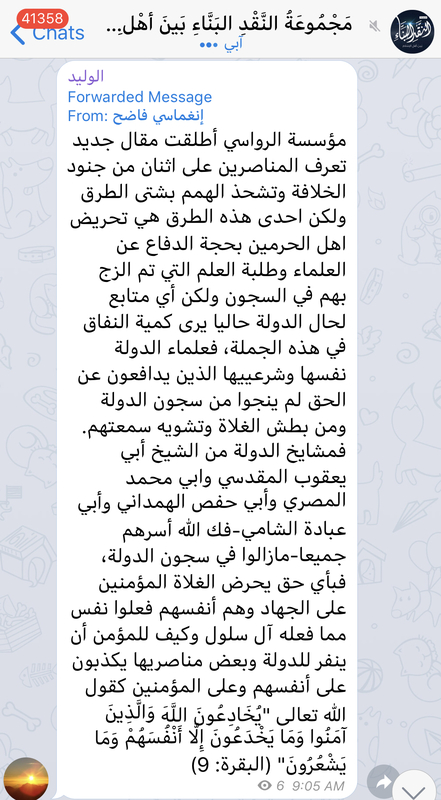 Statement by “Inghimasi Fadih,” Telegram Messenger, September 19, 2018, available at http://www.jihadica.com/wp-content/uploads/2018/09/inghimasi-fadih.jpg.